Well lots of half days this week, we are so busy it is making my head spin! Double half days every day which is a good thing! Today on our february islamorada fishing charter we fished a bit further in the backcountry. Yesterday fishing was tough locally around islamorada, with the cold water temperatures from the cold front that passed over the weekend. Though we did catch what we needed and the afternoon picked up quite a bit as it warmed. Today was good all around. This morning first thing we got into a mess of nice pompano which I’ve only been catching a handful of through the winter. 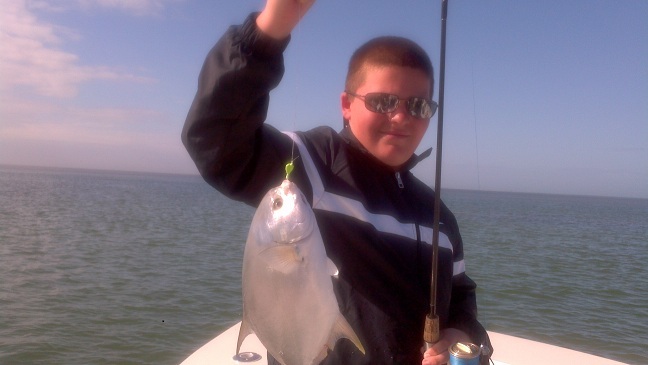 We got about 15 or so pompano fishing in islamorada. Also some nice big drag pulling ladyfish kept mom and son entertained! Next somebody hit the switch and the trout started biting one right after another. Nothing spectacular size wise but it was fun, getting them on shrimp, gulp, artificial, popping cork – you name it! In the afternoon we did the same thing… no pompano this time, but a lot of trout again plus ladyfish and jacks. My same anglers from yesterday afternoon loved it and still had plenty of fresh mangrove snapper we caught yesterday for dinner. All anglers reported sore arms which I like to hear!!! Look for the florida keys fishing in february to pick up and with that hopefully being our last front of the year, tarpon can be just knocking on the door. The water temps did break 70 this afternoon, a few more degrees and the tarpon should be much happier and willing to feed. Well thats all for this february islamorada fishing report. This entry was posted in Backcountry Fishing Reports, Fishing Reports and tagged february, jacks, ladyfish, pompano, trout. Bookmark the permalink.